One of my favorite things to eat at Bandera’s or Houston’s Restaurants (part of the Hillstone group of restaurants) is their Iron-Skillet Cornbread. They serve it as an appetizer, but it really could be a meal with a small side salad. Cheesy rich and yummy on the inside, and crunchy on the outside from baking in the cast-iron skillet. 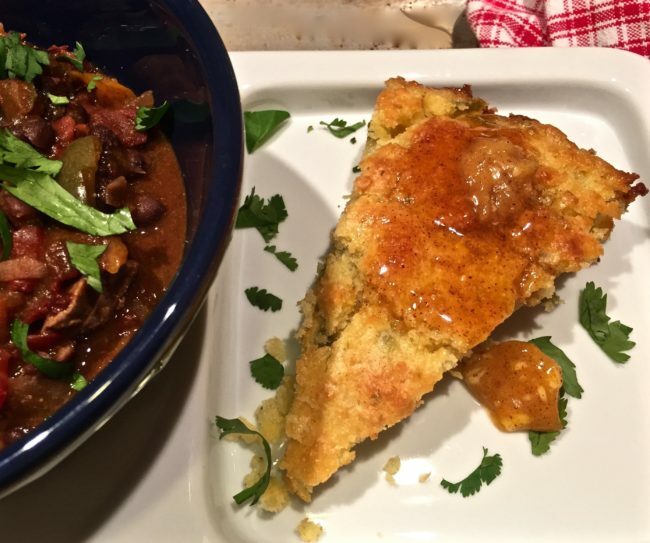 I was so excited to see the recipe in Bon Appetite that Tom and I immediately made it, and it was every bit as good as the restaurant. With all the rain Southern California is (finally!) getting, I decided to make this again, but pump up the volume on the spiciness. 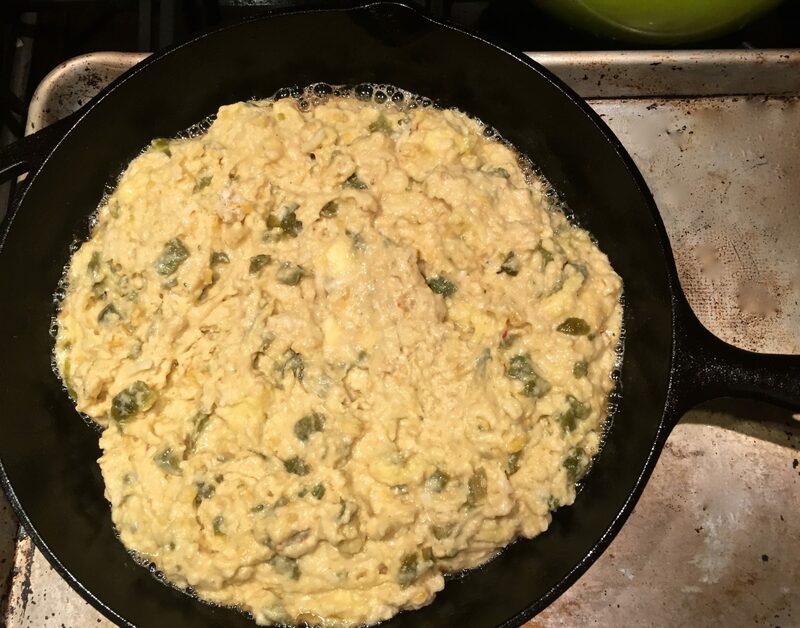 I had some Hatch Green Chiles in the freezer from earlier this year and, because as you know, we like it hot, I replaced the white cheddar cheese with Cabot’s Habanero Cheddar Cheese. 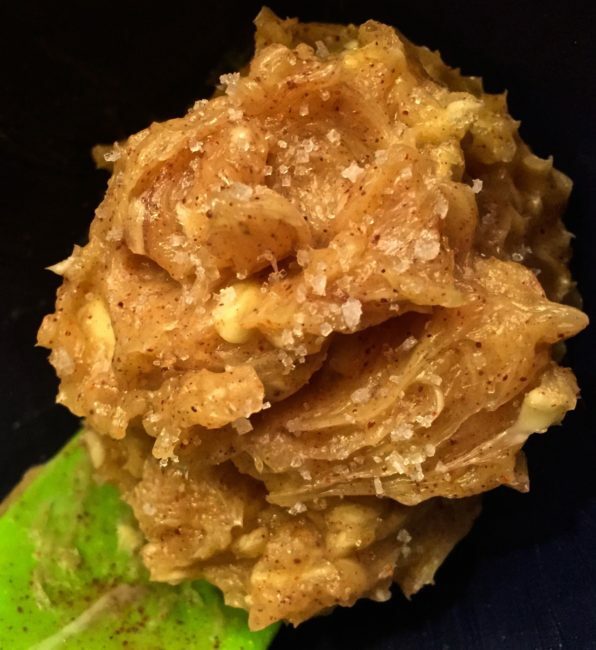 The recipe calls for one and a half sticks of butter, so I used the leftover half stick to make honey butter and tossed in some Hatch Chile powder to take it up a notch. Channeling my inner Emeril … BAM! 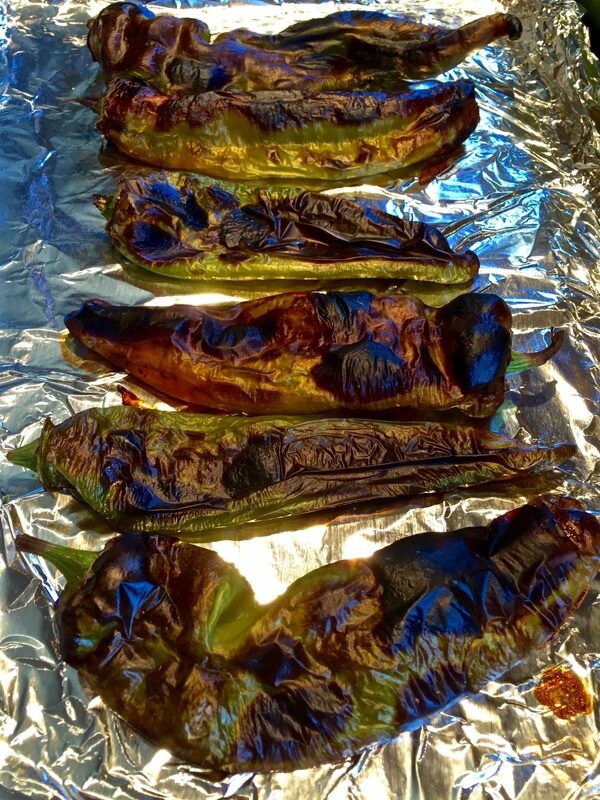 We either barbecue the chiles or roast them in the broiler. Turn the chiles over so that they blacken on all sides. Place in a brown paper bag and roll up the end to let them sweat. Once they are cooled, you can peel the skins off and remove the seeds under running water and use immediately. I like to freeze them in small baggies and use them throughout the year. They can be frozen for up to two years without removing the skins and seeds. Be aware that freezing them can make them spicier…and hotter. 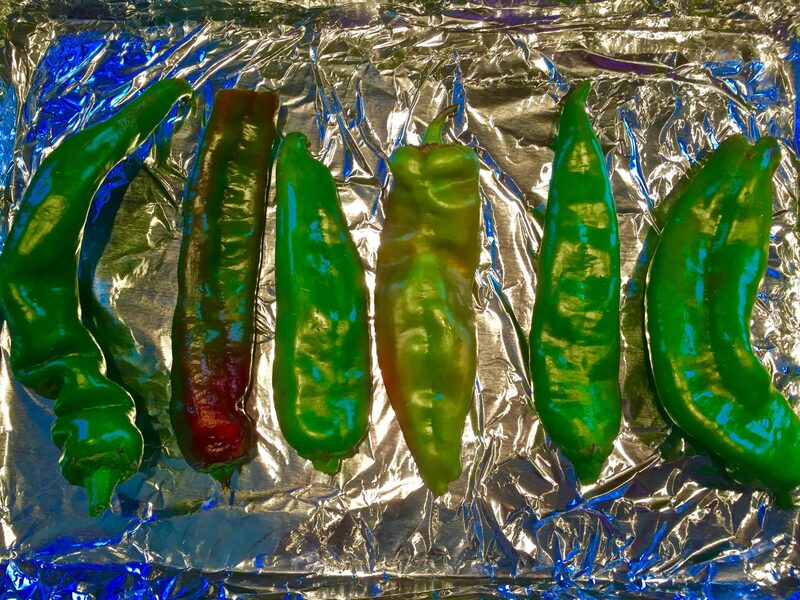 Many people need to use gloves to remove the skins and seeds from the chiles. I just run them under cold water, but I have to be honest, it does make my eyes run. If you choose not to wear gloves, be extra careful not to touch your eyes, your pet, or anyone else as it will burn like crazy. 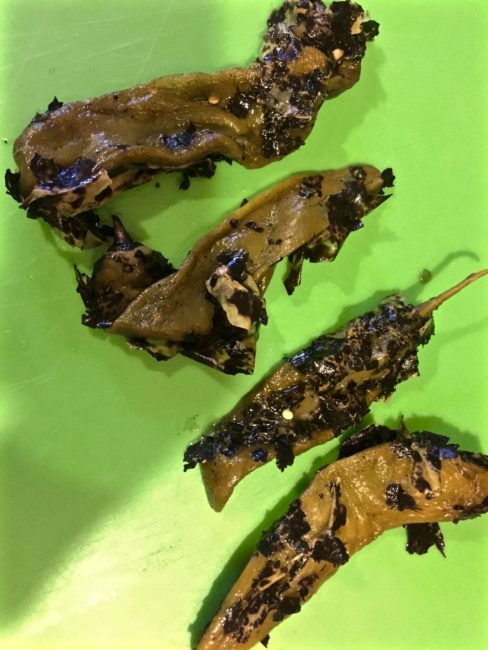 Here is a helpful link to Melissa’s Produce that gives you information all about Hatch chiles. …and a couple of our favorite movies, we are all set for a rainy night (or any night for that matter)! Mix together with a fork or small rubber spatula until fully incorporated. Top with a pinch of fleur de sel to taste. 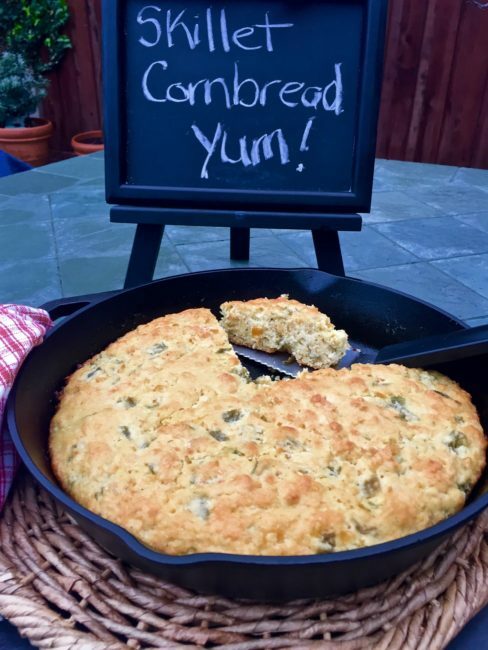 Slather on the cornbread and enjoy! Place rack in the middle of the oven. 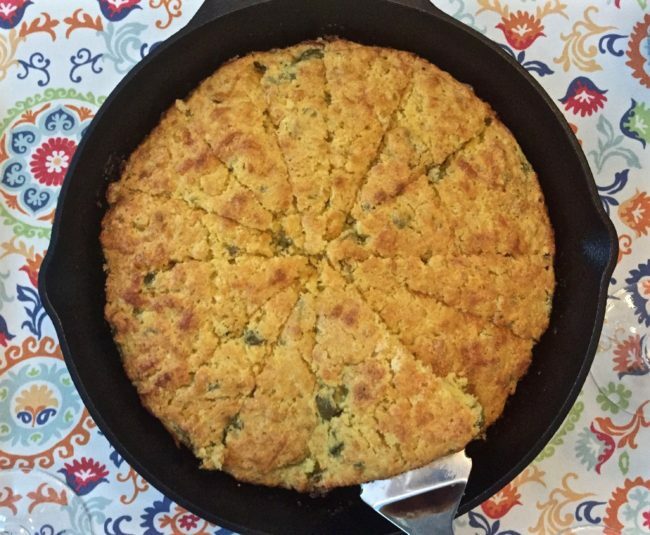 Set 10” cast-iron skillet on a rimmed baking sheet in the oven and preheat the oven to 400 degrees F.
Whisk flour, cornmeal, baking powder, and salt in a small bowl to combine. In another bowl, lightly beat eggs to blend, whisk in the creamed corn, chiles and cheeses. 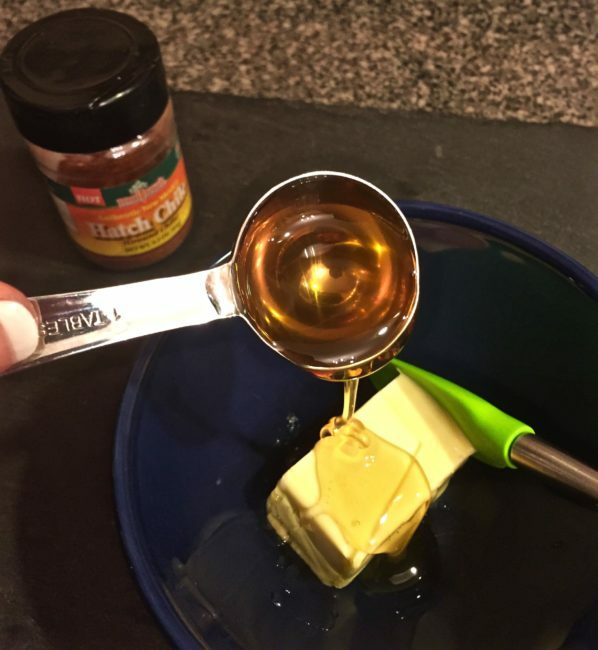 In a large bowl, mix butter and sugar with a wooden spoon just until the butter absorbs the sugar, but the butter is still in pieces. 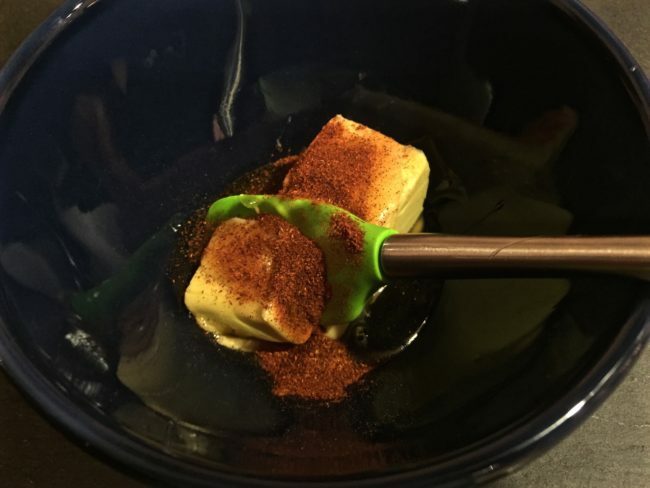 Add egg mixture and mix until just combined. 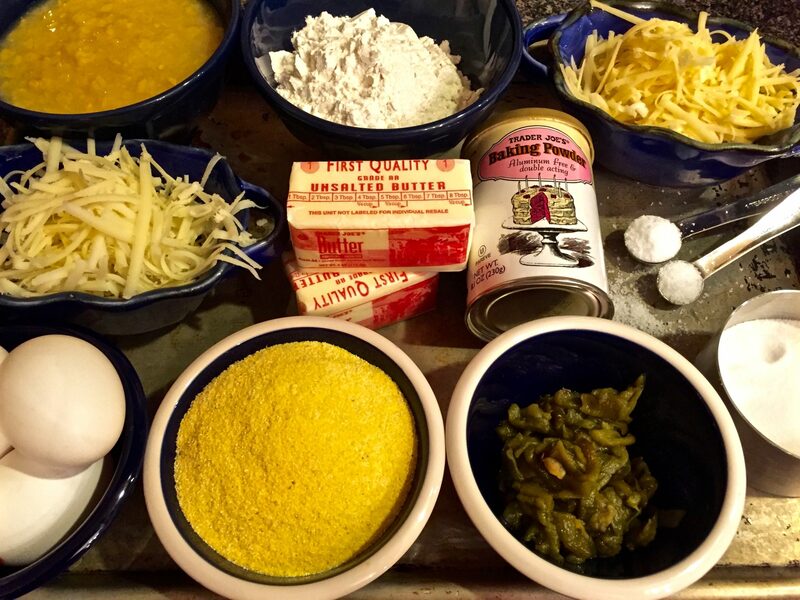 Mix in the dry ingredients until barely incorporated. 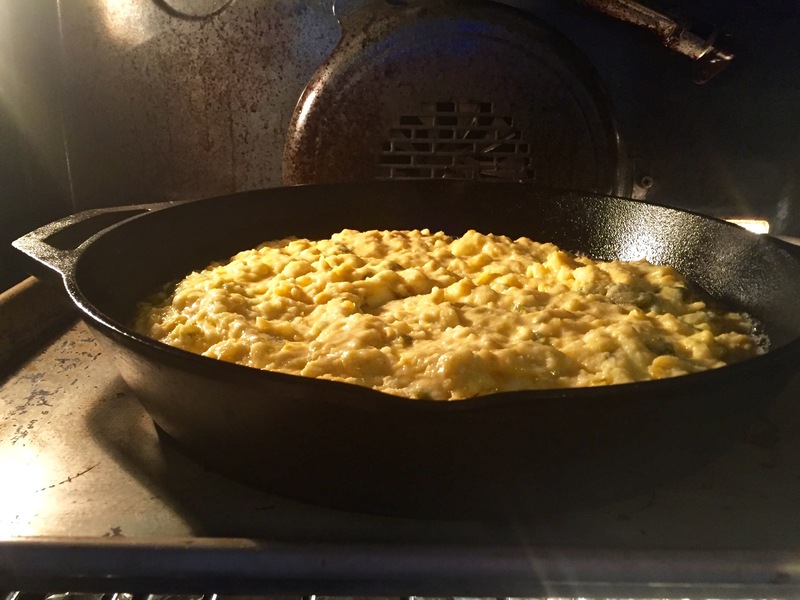 Once the oven is preheated, remove the skillet from the oven and lightly coat with the non-stick spray. (Don’t be like me and forget the skillet is very hot and touch the handle…grrrr.) Scrape in the batter (it should sizzle on contact and stay slightly mounded in the center). 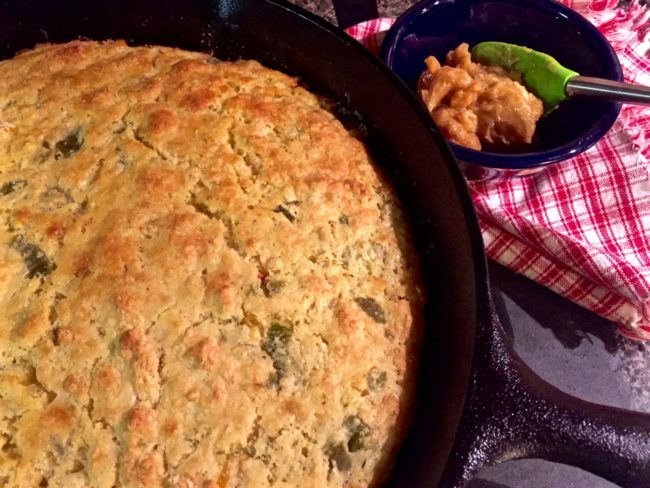 Return the skillet to the oven on the baking sheet. Bake until the top is golden brown and springs back when gently pressed, about 35-45 minutes. Let cool 10 minutes before serving. 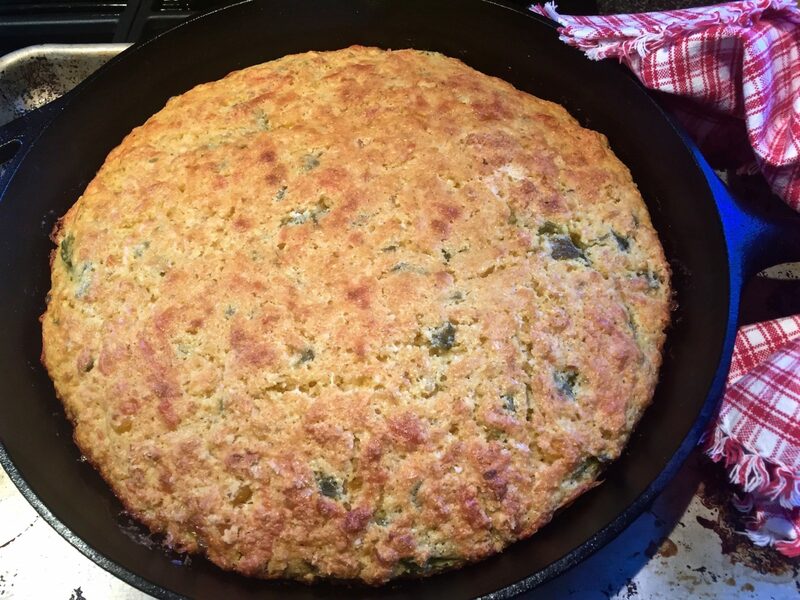 Makes 4 giant pieces of cornbread, 8 more reasonably sized pieces (or even more if you cut the slices smaller).